And now children (and adults) with the use of only one hand can play along on the one-handed 4-hole Oc, following specially adapted Ocarina music. Our friend AJ (pictured below) is in Year 2 and plays the one-handed Oc along with her classmates in whole-class Ocarina lessons. You can see the ease with which she can cover each of the four holes to play a full octave of notes. This 4-hole Oc has three finger holes on the top and one thumb-hole underneath. If you look carefully at our Introducing Ocarinas Video you will also see a child playing the one-handed Ocarina. 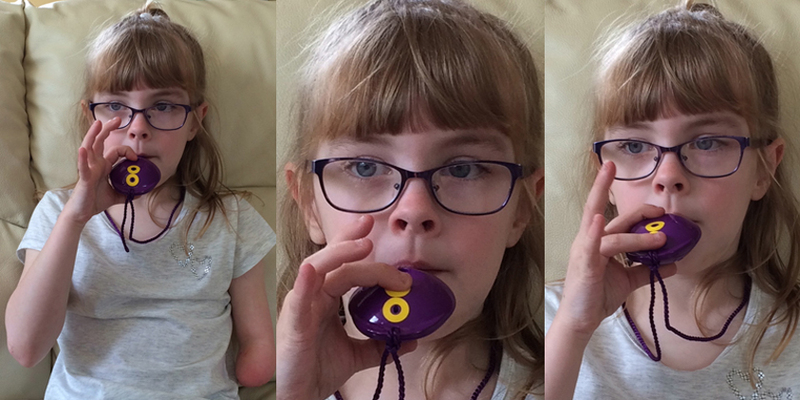 For many years, teachers have been able to include children with the use of only one hand in Ocarina lessons – the specially adapted instrument and music mean that no differentiation is needed. AJ has chosen to add hole reinforcers to make the holes easier to feel (we can supply and fit these). We trust that you will find the Ocarina the most appropriate, inclusive and accessible instrument – for ALL your children.